Grind coriander leaves , chilies,ginger,salt black salt,tamarind paste,sugar,lemon juice,zeera powder together.add water while grinding. Sieve the mixture.throw the left over on sieve and retain the water. Dilute this pani poori mixture as per your taste and need. put it in fridge to cool. 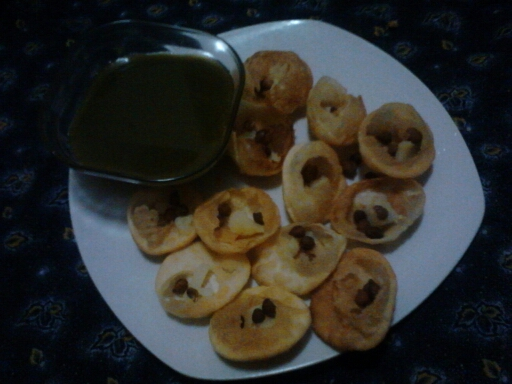 Take the above prepared poori make a hole on one side .put boiled and diced potatoes, boiled chana and cold pani poori mixture.